•Jericho’s walls may have tumbled down because the city lies on a fault line. •Moses never parted the Red Sea. •There was a Jesus, but he wasn’t born on Christmas and he probably wasn’t an only child. 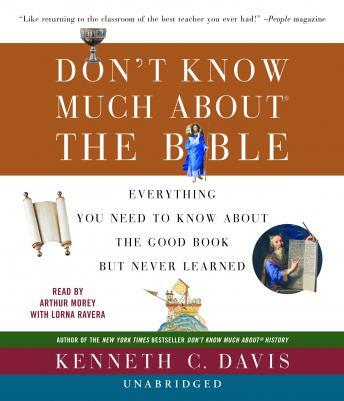 Don’t Know Much About® the Bible entertains and astonishes, but more important, provides a much better understanding of the world’s most-owned but least-understood anthology, with much more fun along the way. I loved the book (and bought it too). It is a great reference book. I enjoy the way Kenneth Davis arranges the material. He gives a “plot summary” for each book and “biblical voices” for important quotes. He discusses the writers and origins of each book as well as the scientist and religious scholar dispute regarding people and legitimacy of details. He also corresponds the date of human history with the supposed date of creation (writing) for each book. I would recommend the book!